The brothers Thomas, George and John Hall and their families came out to Lyttelton in the early 1850s and established themselves as large land holders. It was common practice to lease adjoining runs as it made it easier to stock and to work the stations together. On May 1 1864 the first list of runs in Canterbury was published officially. George Hall b. 4 Jan. 1782 to John Hall. He went to sea as a cabin boy in 1795. Master mariner and ship owner. His family had been merchants in Hull since 1657. Married Grace Williamson 21 Oct. 1817 in Holy Trinity, Kingston upon Hull, England. George wrote a book about his prison escapes from the French during the Napoleonic wars. Capt. Hall died 29 Aug. 1865 in Elloughton, England. b. 7 Sep. 1818 in Sculcoates, Yorkshire, England to Captain George Hall and Grace Williamson, George was a brother to Sir John Hall and Thomas Williamson Hall. For a few years he served in the merchant service and rose to the rank of captain. Married Agnes Emma Dryden about 1850 in Kingston upon Hull, Yorkshire, ENG. Agnes was a sister of Sir John Hall's wife, Rose. Both George and his brother Thomas were master mariners. George came to New Zealand in 1853 on the "Royal Albert" and acquired Highbank Station on the Rakaia River and later a property at Springfield, 'Springfield Station' with John & Thomas and had an interest in Balmoral Station, and Sawdon Station and possibly others in the Mackenzie. George W. Hall took up the 60,000 acre Braemar Station May 1858. Edward Glave Stericker Stericker was in working partnership with George Hall in a station in the Ashburton Forks, 'Ringwood' when news of the great new sheep country in the South Island was noticed. George and E.G. Stericker took up Run 252, the Sawdon Flats, in August 1858 added the 20,000 acres Whalesback Flat and in November 1859 Sawdon hill run, No. 320, was added. Stericker's father John was from Sawdon near Scarborough, England. The Halls and the Stericker dissolved partnership in 1862, the year following the great snowstorm. It was common practice to lease adjoining runs, made it easier to stock. 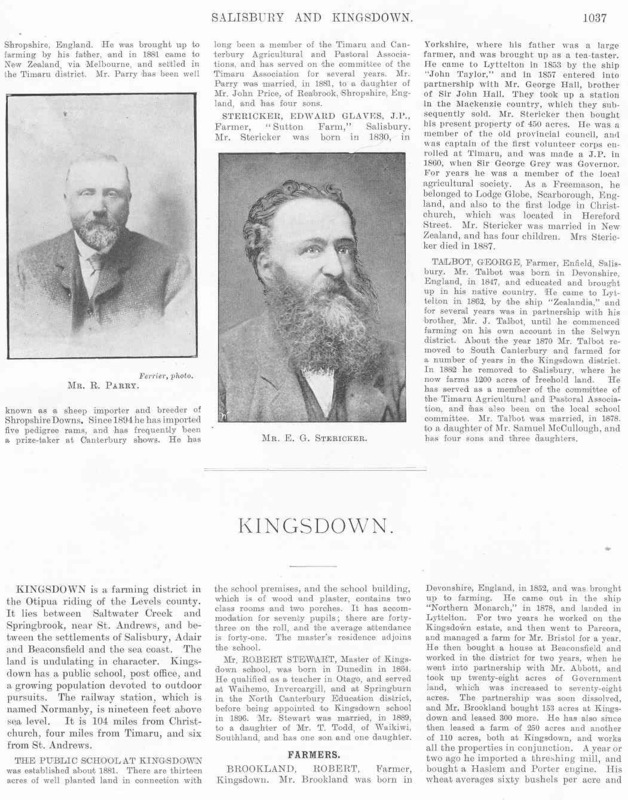 Altogether the three Hall brothers owned or leased 130,000 acres in the Mackenzie Country. They leased all the land between the Haldon road and the Tekapo River but sold these interests at the end of the 1860s. George was elected as the 1861-2 representative for Heathcote to the Christchurch Provincial Council. G.W. Hall died 27 Feb. 1896 in Lyttelton and was buried at the Hororata Cemetery. HALL - On December 20th, 1880, shot by the Boers, at Standerton, the Transvaal, George Buceo, second son of Mr T. W. Hall, Timaru, aged 30 years. Standerton Military Cemetery in the Transvaal province (now called Mpumalanga) and was up from the main town. It was quite a large headstone and it was well kept. Son of Thomas W. Hall Esq. Married. Wakefield-Hall. On July 15th, at St Michael's Church, Christchurch, Edward, fifth son of Felix Wakefield, to Agnes Mildred, only daughter of George Williamson Hall. Their daughter Agnes Mildred Hall m. Edward Wakefield on 15 July 1874 in St. Michael's Anglican Church, Christchurch. Edward was a son of Felix Wakefield. Edward represented Geraldine as their first representative in Parliament in 1875 to 1881. He was at this time editor of the Timaru Herald. Agnes as Mrs E. Wakefield opened the Timaru Borough Council office at a ceremony 10 July 1877. She later divorced him Second marriage to Edward Withers 12 Aug. 1886 in Wesleyan Church, Christchurch. On 15 July 1874, at Christchurch, Felix Wakefield married Agnes Mildred Hall, niece of Sir John Hall; they were to have at least two sons and a daughter. In 1875 Wakefield was elected MHR for Geraldine on the returning officer's casting vote. Regarded even by enemies as brilliant, he was aggressively ambitious. He subjected John Ballance, Sir George Grey's colonial treasurer, to memorable parliamentary maulings, and in August 1879 delivered what William Rolleston considered 'the finest speech ever made in the House'. Wakefield was defeated in 1881, but, having pledged to oppose Harry Atkinson, was returned unopposed for Selwyn in 1884. Left out of the first Stout–Vogel ministry, he changed sides, becoming Atkinson's colonial secretary; when Atkinson's week-old government fell he received a package in the shaped of a rat from his constituents. Wakefield encountered difficulties in his personal life in 1886. He and Agnes were divorced in August, and one week later Agnes married Edward Withers; their daughter, Aimée Mildred, was born on 10 September 1886. West Coast Times, 15 September 1884, Page 2 A recent Southern mail. The Post says: Yesterday's mail brought up an exceedingly unsavoury package, in the shape of a dead rat, addressed to Edward Wakefield, Esq M. H.R. The body arrived in rather a dilapidated condition, owing to the effect of the force used in defacing tbe postage stamps." The Wakefield Divorce Case. Commenoed in the Divorce Court at Dunedin, in the case of Wakefield v. Wakefield and Withers. The action is by Mr. Edward Wakefield, M.H.R. for Selwyn, against his wife, for a divorce, on the ground of adultery with the co-respondent Withers, a son of the late Major Withers, and at one time accountant in the Colonial Bank of New Zealand in Auckland, and more recently manager of a branch of the same bank at Timaru. The parties were married several years since at St. Michael's Church, Chriatchurch, the respondent being the only daughter of Mr. G. W. Hall, of Christchurch, one of the early Canterbury squatters, and a brother of Sir John Hall. Soon after the marriage they went to reside at Timaru, where Mr. Wakefield became editor of the Timaru Herald, and afterwards a member of the House of Representatives for Geraldine. A little more than a year ago Mr. Wakefield resigned his position in Timaru and went to Wellington, where he became the editor and part proprietor of the Evening Press in that city. He left his wife, and two or three children by the marriage, in their home at Timaru, and it is alleged that during his rather long absence the adultery was committed, and that ths respondent made a confession to a near relative as to her misconduct. Born 18 Nov. 1819 in Kingston upon Hull, Yorkshire, England. He was the son of Captain George Hall and Grace Williamson of Elloughton near Hull, England. Thomas had been a sea captain as well as his brother George. Thomas left England on the Mohammed Shah with his wife Sarah and his three children: Tom, John, and William (a new born baby). The ship caught fire near Australia, and Thomas was commended for his bravery in the rescue of some of the passengers. They were stranded on an island for three days before rescue, were left with out any possessions, and were landed at Hobart. The family arrived in New Zealand in 1853. One son was shot by the Boers a year after the Zulu war and another son, Tom, went wrong. Thomas was one of the earliest men to take up land in the Mackenzie Country and was said to have name Irishman's Creek after the wild Irishman bushes growing there. Thomas Hall acquired 20,000 acres near the southern boundary of The Mistake. He also owned Glenmore with John. The 10,000 acre Run 274, on the Balmoral plateau, was taken up by T.W. Hall on 30 September 1858. Runs 274, 325 and 326 formed the old Braemar Station. In 1867 T.W. Hall sold runs 274 and 325 to Alfred Cox for £1000. On 1 December 1859 T.W. Hall applied for another 10,000 acres to the north. They worked the stations together. First sold the Braemar sections. August 20 1867 sold 50,000 acres (The Mistake and run 275) and 7,000 sheep to A.B. Smith and William Saunders for £13,000. Later Thomas lived at Elloughton Grange, Timaru which in those days was in Halls Road now Pages Road. After selling the property to William Grant to moved to Le Cren's Terrace (now The Terrace.) He was a member of the first Timaru Road Board 1864, the Timaru and Gladstone Board of Works 1873, South Canterbury Education Board 1877, Timaru Harbour Board 1877 and the South Canterbury Hospital Board. Died: 12 Dec. 1895 in Invercargill. 1a. Thomas Hall b.1847 in Kingston upon Hull, England to Thomas Williamson Hall and Sarah Young. As a youth Tom Hall managed a sheep station, Castle Hall Station, owned by his uncle, John Hall, later Sir John Hall, premier of NZ. Married Kate Emily Epsie Cain 26 May 1885 in Timaru. Thomas Hall murdered her father, Capt. Cain in January 1886 and attempted to murdered Kate in August 1886 after the birth of their son Nigel Cuthbert Hall b. 19 June 1886. Kate divorced him in 1902. Hall was released from Mount Eden prison, Auckland, in 1907. Sir John Hall granted him an annuity of £200 on condition that he live the remainder of his life out of New Zealand. Star 28 December 1895, Page 7 OBITUARY. A southern contemporary announces the death at Invercargill, at the age of 76, of Thomas Williamson Hall, who was one of the early settlers, and for many years a prominent public man in South Canterbury. The deceased, with his brothers, Sir John Hall and Mr George Hall, was a member of a well-known family of shipowners and shipmasters of Hull. He was educated in France and Germany, and at the age of sixteen went to sea, becoming an owner and master on his own account at an early age. In 1853, with his wife and two young children, he set sail for New Zealand. The vessel they came in as passengers, the Mohammed Shah, was burnt at sea off Australia, but the ship's company -were fortunate enough to be rescued by a brig "Ellen" belonging to Van Diemen's Land. Mr Hall, after a short look round, betook himself to pastoral pursuits. He took up a run on the Rakaia, and later became one of the pioneer pastoralists of the Mackenzie Country. He subsequently removed to Invercargill, where he resided until the time of his death. He was not a public man in. the same sense as his brother, Sir John, but he took an active interest in local affairs, being a member of the Timaru and Gladstone Board of Works, chairman of the Hospital Board, and member and some time chairman of the Timaru Harbour Board. He was one of the earliest and most energetic advocates for the construction of a harbour at Timaru, and had not a little to do with the selection of Mr Goodall's design for the work from among the competitive plans. Mrs Hall, a hale old lady, two years her husband's senior, survives him, as do several grown up sons. Born at Hull, England, 18 Dec. 1824, and was baptised on 31 Jan. 1825. Educated on the Continent. John served as a special constable during the Chartist riots in England in 1848. He arrived in Lyttelton aboard the Samarang 31 July 1852. His brothers George and Thomas arriving soon after. The following year, he leased the land which would become the major part of his property in Mid Canterbury at Hororata, Rakaia Terrace Station on the north bank of Rakaia River (The Terrace Station.) In 1853 he was elected at its inception to the Canterbury Provincial Council and was a member until abolition of the Provinces more than twenty years later. He was in the Mackenzie by 1858. On 2nd May 1859 John claimed run 296, the Grampian Hills homestead run but transfer the title to John Tucker Ford or Harry Ford in 1860. On the west side of Lake Tekapo, Joseph Beswick, a friend of John Hall, took up 20,000 acres in 1858 and named it Gristhorpe. John Hall took over Gristhorpe in 1867 and renamed it The Castle and later it became known as Castle Hall Station. In March 1869 John sold Balmoral and Castle Hall which he worked as one to Alfred Cox. The price was £13,500 and 20,000 sheep. Cox also purchased from T.W. Hall and John Fraser the Braemar runs. In 1873 John McGregor claimed country at the forks of the Cass river and named it Glenmore and incorporated Castle Hall into his holdings and retained the name Glenmore for both properties. John leased The Mistake named became mistake in the boundary. John Hall did not live on any of his Mackenzie country stations. J.W. Buller was the manger for all of Hall's stations. At Burkes Pass is The Long Cutting. Thomas Teschemaker, John Hall and John Hayhurst are credited with digging it out so bullock drays could drive over the Pass. John married Rose Anne Dryden in 1861 at Hull. She was the sister to Agnes Emma Dryden who married his brother George W. Hall. Mr and Mrs John Hall returned to Christchurch in October 1861 in the Royal Stuart. He was a resident magistrate first at Lyttelton then Christchurch from 1856 to 1860. 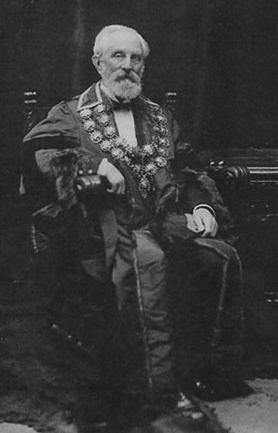 He became the first chairman of the Christchurch Town Council in 1862. In 1863 he was elected the first Mayor of Christchurch but resigned within months as he needed time for his other public commitments. He was represented the Mount Cook district from 1864-1866 on the Canterbury Provincial Council. John Hall was MP from 1855 to 1860, from 1862 to 1883 and from 1887 to his retirement from politics in November 1893. John became premier of New Zealand 8 Oct. 1879– 21 April 1882 succeeding Sir George Grey, and took the portfolios of Colonial Secretary, Post and Telegraph and Customs. He was knighted May 1882. Known most notably for his support of women's suffrage. In 1893 his Female Franchise Bills passed and became law in Sept. 1893. Sir John Hall died 25 June 1907 at age 82. He had four sons and two daughters. His son Wilfred Hall had the house at “Gunyah”, Hororata, built in 1913. Gunyah was once part of Terrace Station. Mr John Dryden Hall was the second son of Sir John Hall. Any family tree produces some lemons, some nuts, and a few bad apples.